Our dinner last night was nice and colourful. 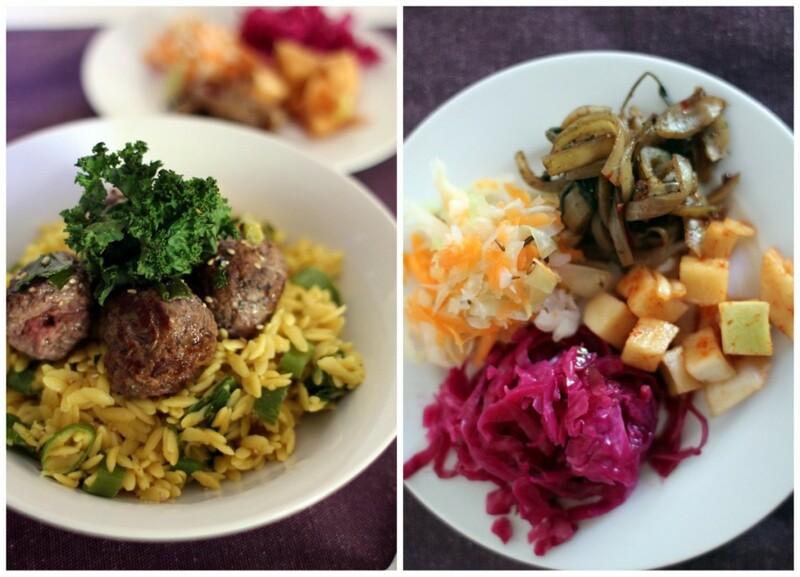 I made meatballs on risoni for Daniel’s main and put some fermented veggies on the side. Home-made sauerkraut, Kimchi and balsamic braised onions – yum and full of probiotics! Multi-coloured foods just don’t look pretty on the plate. They are also good for your health. Phytochemicals are substances that occur naturally in the plants and are thought to work synergistically with vitamins, minerals and fibre, boosting essential nutrients in them. Eating five servings of veggies is important, but also eating a variety of colourful foods helps to achieve optimal nutrition and promote good health. So overall, the more colours you eat, the better your health gets. I know it is hard if you are not used to eating fresh whole foods or have a hectic lifestyle with no time to prepare your meals. But it is totally worth spending a bit of more time and effort on changing your diet step by step because it will totally change your energy level and overall health. – Make small changes in your food habits – more plant foods means more colours!